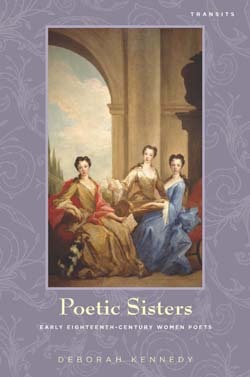 Bucknell University Press congratulates Deborah Kennedy on her book Poetic Sisters: Early Eighteenth-Century Women Poets being selected as one of Choice’s “Outstanding Academic Titles of 2013.” Choice describes Professor’s Kennedy’s book as “engagingly written” and “beautifully illustrated (visually and poetically)” and recommends the title for both students and scholars. The book’s “Outstanding Academic Title” distinction was given in consideration of criteria that included “overall excellence in presentation and scholarship” and “importance relative to other literature in the field.” We had the pleasure of conducting an interview with Professor Kennedy via e-mail, in which she explained why the early eighteenth century was an important period for women poets and touched upon how the book might resonate with readers today. BUP: What gave you the inspiration to write Poetic Sisters? DK: I developed the idea for the book while teaching my courses on eighteenth-century literature and on British women writers. The Meridian Anthology of Early Women Writers, edited by William McCarthy and Katharine Rogers, was a fantastic early resource, just brimming over with great poems by Anne Finch. I don’t think one can overstate the value of textbooks and anthologies and the relationship between research and pedagogy. Where would one be without, for instance, the pioneering Norton Anthology of Literature by Women, edited by Sandra Gilbert and Susan Gubar; and Roger Lonsdale’s Eighteenth-Century Women Poets (with its unsurpassed biographical and bibliographical material). I remember being struck by the Countess of Hertford’s enchanting country-house poem in Lonsdale’s anthology, and that poem with its light-hearted opening line—“We sometimes ride, and sometimes walk”—made me want to learn more about her. Hertford eventually became the subject of chapter four in my book. So for me it was about celebrating these fascinating voices from the early eighteenth century. Of course, of the five poets, Anne Finch is the best known. Her work provides the cornerstone for my study, but she is read in conjunction with other women who were writing around the same time and into the early Georgian period. BUP: You write that “in the early eighteenth century, an unprecedented number of women began to write and publish poetry.” What was it about this period that enabled their artistry? DK: Many examples in the book show how much women enjoyed writing poetry. Poetry was not only high art; it was playful, and for the ladies in this book it was also a vocation. By the early eighteenth century, there was more acceptance of women writers. Literacy increased, publishing increased, theater and music were popular pastimes, and women sometimes had their portraits done holding a book or seated at a table with books. In the Restoration period Katherine Philips (whose pen name was Orinda) was greatly respected, and Elizabeth Rowe gained a similar respect. Rowe (whose maiden name was appropriately enough “Singer”) was a real literary star, and the story of her life would make a great movie. Rowe had a huge readership not only in England but through Europe and especially in North America. As I explain in my book, one can trace the development of the reception and reputation of women poets over time. In 1686, the Poet Laureate John Dryden showed his support for women poets in his celebrated “Ode” to Anne Killigrew. Later, Jane Brereton wrote of Anne Finch, “at Finch’s tomb be honours paid.” So, even though jokes were still made about mad poetesses and about whether women were better off making puddings and pies, the woman writer was not always a caricature; she could also be an ennobling figure. BUP: In the book’s introduction you mention that you chose these particular female poets from among dozens of others who wrote during the early eighteenth century. How did you choose these particular female poets? DK: I chose these five poets because their poems were so appealing and full of life and depth, and also because of the interesting connections among these particular women. They are not literally “sisters,” but I refer to them as “poetic sisters” because of their shared vocation as poets. The Countess of Hertford, who was raised at Longleat, was the great-niece of Anne and Heneage Finch; and she was a dear friend of Elizabeth Rowe. Mary Jones, who lived in Oxford, knew Hertford, and there were several connections between Sarah Dixon and Finch in their neighboring villages and towns in Kent. Along with these links between them, there is a moral core that underlies all their work. Most of all, I found these writers interesting: their walks in the woods, their religious faith, their frank acknowledgement of life’s difficulties, and their humorous comments on everything from card games to hoop skirts. BUP: In what ways do you think the lives and works of the poets in your book might resonate with contemporary readers? DK: These poets wrote about very human matters that can touch us and entertain us today. Wit and wisdom travel easily across the centuries. On the serious side, one finds oneself transported by the calm of the night sky in Finch’s “Nocturnal Reverie” or by Rowe’s wistful thoughts about angels. Sarah Dixon, who shows so much insight into matters of the heart, embodies the merits of family loyalty and patriotism. On the lighter side, many students can relate to Jones’s “Soliloquy upon an Empty Purse,” a poem about not having any money. In the book, I make a parallel between Sophie Kinsella’s novel Shopaholic and Sister and Finch’s amusing poem “Ardelia’s Answer to Ephelia,” about a fashionista friend. Finally, the Countess of Hertford fits right in to today’s eco-friendly world with her advice that walking was better for one’s health “than any medicine in the dispensary.” There is a good chance that readers will find a kindred spirit in at least one of these poets. BUP: What were some of the challenges of writing this book? DK: The main challenges involved seeking out biographical information to provide an accurate outline of the lives of each author. This required a great deal of scholarly detective work, such as reading wills, looking at baptismal records, deciphering old hand-writing, and tracking down obscure books, documents, and illustrations far and wide. But that research also gave flesh and blood to each of the five poets and made them more real. As a result, for example, one can now picture Elizabeth Rowe, walking outside, wearing her long red cloak—a poet in the English landscape. BUP: Are there any words you would like to leave us with? DK: It is an honour to be one of the recipients of the award for the Choice Outstanding Academic Title, and I am delighted that more people will get to know Anne Finch, Elizabeth Rowe, the Countess of Hertford, Sarah Dixon, and Mary Jones, the five poetic sisters.